Cellulitis is a type of infection that affects the skin and the tissue underneath. 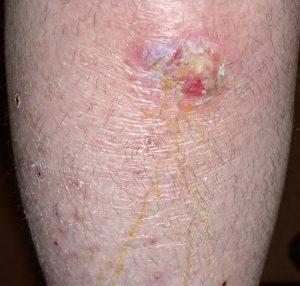 The bacteria, most commonly Group A streptococcal bacteria, enter the skin through an opening, such as cut, scrape, burn, or surgical incision, or even a bug bite or sting. Cellulitis can trigger sepsis in some people. Sometimes incorrectly called blood poisoning by members of the general public, sepsis is the body’s often deadly response to infection or injury. Sepsis kills and disables millions and requires early suspicion and treatment for survival. Often incorrectly called blood poisoning, sepsis is the body’s often deadly response to infection. Sepsis and septic shock can result from an infection anywhere in the body, such as pneumonia, influenza, and urinary tract infections. Worldwide, one-third of people who develop sepsis die. Many who do survive are left with life-changing effects, such as post-traumatic stress disorder (PTSD), chronic pain and fatigue, organ dysfunction (organs don’t work properly) and/or amputations. Impaired immune system: People who have an impaired immune system are more vulnerable to contracting infections. These include people who are undergoing chemotherapy or who take corticosteroids. Visit Sepsis and Impaired Immune System to learn more. Skin conditions or disorders: Skin conditions and disorders can cause breaks in the skin. These include eczema, shingles, even so-called childhood illnesses like chicken pox. Lymphedema: Lymphedema is a swelling of an arm or leg, most commonly caused by the removal of or damage to the lymph nodes as a part of cancer treatment. The swollen and stretched skin can crack. Obesity: People who are obese have a higher risk of having cellulitis and of getting it again. History of cellulitis: If you’ve had cellulitis before, you do have a higher risk of getting it again. If you suspect you have cellulitis, see your doctor or nurse practitioner. If you are given antibiotics, it is vital that you take them as prescribed, right to the end of the prescription, even if it appears the infection has gone away before the prescription bottle is empty. Ask your doctor or nurse practitioner when you should start seeing improvement. If you feel that the infection is worsening or there is no improvement despite treatment, you should have the infection checked again.